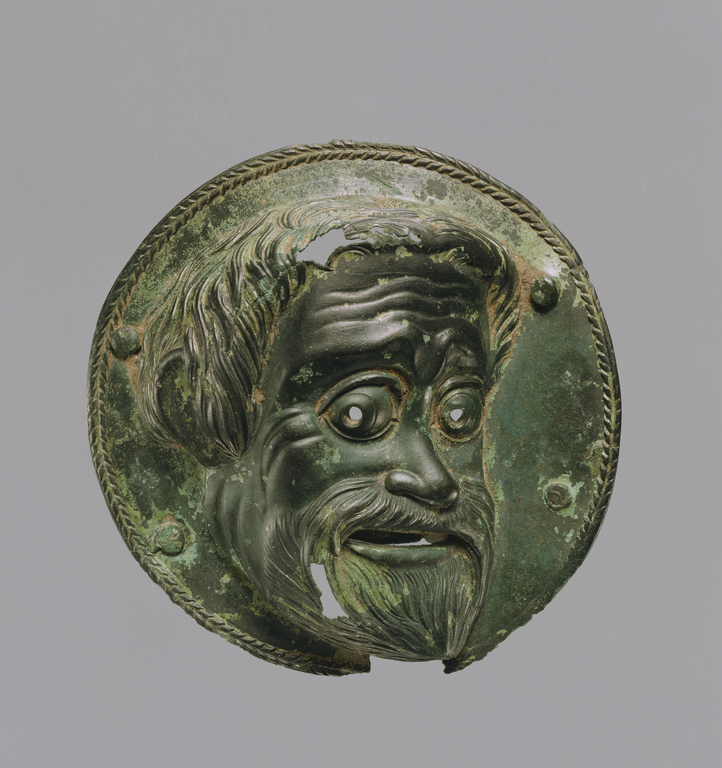 A mask of the sort worn by an actor in a comic play decorates this bronze roundel. Shown in three-quarter view against a plain background, the high relief, repoussé mask has straight hair brushed back from a receding hairline, a thick moustache and a small, pointed beard. The raised eyebrows cause the forehead to crease, and the eyes, framed by crow's feet, roll to the side. The full lips appear to be natural rather than the artificial mouthpiece of a mask. These features suggest that this mask represents a leading slave role. The form of the mask and the expression of impish guile are very similar to masks decorating pottery made in the Greek colonies in South Italy, especially in Apulia. On the back of the roundel, two bronze bands attached with rivets would have held a thick, narrow strap running vertically. This arrangement of attachment points suggests that the roundel was probably a bridle ornament. Acanthus Gallery (New York, New York), sold to Barbara and Lawrence Fleischman, 1987. True, Marion, and Kenneth Hamma, eds. A Passion For Antiquities. Ancient Art from the Collection of Barbara and Lawrence Fleischman, exh. cat. (Malibu: The J. Paul Getty Museum, 1994), p. 74, cat. no. 30. "Museum Acquisitions Between July 1, 1996, and June 30, 1998." The Report of the J. Paul Getty Trust (1997-98), p. 65.